A Study In Terror may not be one of the more recognised Sherlock Holmes feature films, but it is extremely enjoyable and dripping with atmosphere. Albeit garish late sixties atmosphere. This Holmes adventure has the venerable sleuth matching wits with Jack The Ripper. Holmes and The Ripper would meet again in the excellent film, Murder By Decree. This film has just enough facts scattered throughout the story to drag you into The Ripper’s world, but not enough to turn it into a classic Ripper story. And in a way that is a good thing. This is first and foremost a rip-roaring Sherlock Holmes adventure, and examining the Ripper legend down to the finest minutiae would slow down the story and ruin the cracking entertainment that has been placed before us. In this production John Neville is Sherlock Holmes. Apart from Terry Gilliam’s The Adventures Of Baron Munchausen, I can’t recall seeing Neville in anything else. But he plays a good Holmes. Donald Houston occupies the role of Dr. Watson. Having recently seen Houston as a Nazi spy in Where Eagles Dare I found it hard to trust the guy. If I was Holmes, I wouldn’t turn my back him. I guess he is okay, and thankfully doesn’t play the role as a buffoon. The film opens in Whitechapel on a foggy night. Walking the cobbled streets, a lady of the night is stabbed in the throat by an unseen assailant. Next we are dropped into a vibrant pub scene. One of the girls, Polly Nichols is caught stealing a gent’s purse and is thrown out onto the streets. As she makes her way home, she is grabbed from behind and dunked into a water trough. As she flounders in the water, she is stabbed repeatedly. Then we meet Annie Chapman (Carry-On favourite Barbara Windsor). She is all decked out in red and walking the streets after being kicked out of her lodging for being behind in the rent. She scours the town looking for a bed for the night, but all she finds is the blade of Jack The Ripper. Sherlock Holmes is drawn into the case after he receives a mysterious parcel in the post. It is a case full of medical instruments. Holmes quickly deduces that it comes from a pawn shop in Whitechapel, and once belonged to a member of the Osbourne family. Holmes arranges a meeting with obstreperous Lord Osbourne. Osbourne isn’t particularly helpful, but Holmes finds out the case once belonged to his son Michael Osbourne, who ran off to France to become a doctor. Holmes also finds out through Michael’s younger brother, Lord Carfax (John Fraser), that Michael dropped out of school and returned to England and was last seen in Whitechapel where he had married a prostitute, named Angela (Adrienne Corri). As this is a Sherlock Holmes there is plenty more plot convolution. 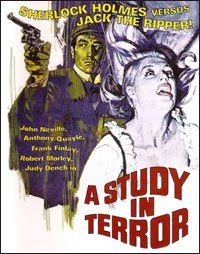 I didn’t expect much from A Study In Terror, but I got a great little Sherlock Holmes thriller which is a lot better than many of the better known Holmes films. The opening line in the film is “Hullo Luv, after a bit of fun?”…and I think that is a perfect introduction to this film, and sums up it’s contents too. It’s bloody good fun.